Single Sentence Review: How would you feel about watching Tom Cruise get murdered over and over? 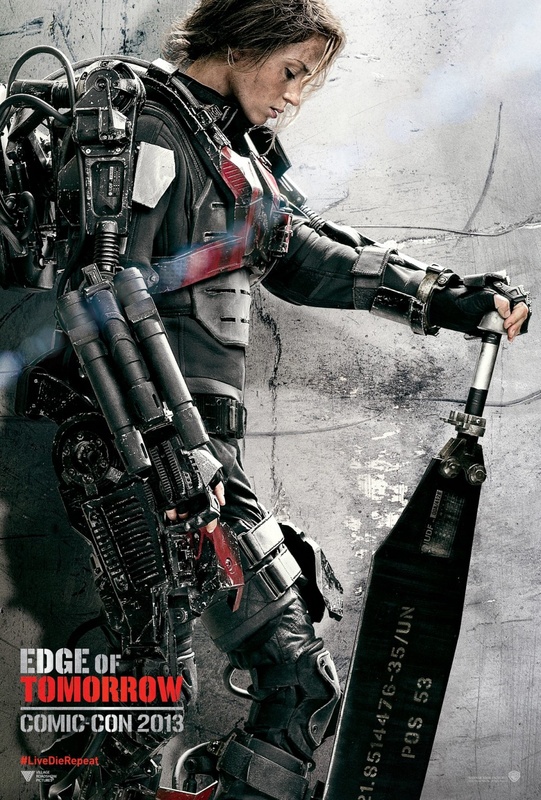 A horrible marketing campaign made it easy to dismiss Edge of Tomorrow as simply Groundhog’s Day meets Starship Troopers although, as with the vast majority of science fiction offerings, Edge of Tomorrow is a refreshingly clever concept wrapped in stale clichés. I think it’s important to note that I walked into this movie with fresh eyes, having never read the novel, All You Need Is Kill, the Japanese Manga, or the American graphic novel. Tom Cruise takes a turn at thwarting this year’s popcorn flick alien invasion, as happenstance grants him a seemingly endless number of temporal Mulligans. Cruise plays Major William Cage, a military promoter who is uncomfortably shoe-horned into taking part in a beach landing along the coast of France (the first of several seemingly purposeless allusions to World Wars I and II) that we are led to believe will be either a staged photo op against marginal resistance or the pivotal moment in humanity’s five year struggle for survival. The human soldiers seem completely unprepared for the threat they face, a fact that stands in stark contrast to the half-decade humanity has spent combating this threat. Cage is killed, only to be inexplicably resurrected at the beginning of the same day. Instead of devolving into a cinematic video game, it’s at this moment that Edge of Tomorrow truly begins to shine. The pacing intensifies, bolstered by editing that is borderline brilliant (some may recall our director, Doug Liman, was also at the helm for the film editing masterwork The Bourne Identity). Action and humor are seamlessly woven into an extended montage as enthralling as any I’ve seen since Disney’s animated feature Up. The concept alone justifies Edge of Tomorrow’s existence and makes it the best science fiction film of the year thus far. A character study this is not: if you’re familiar with the work of Tom Cruise and Emily Blunt, the acting is as utilitarian as you’ve come to expect, and Brendan Gleeson’s formidable talents are utterly wasted in the role of a grumpy general who apparently sleeps in his military surplus fatigues. Much like the acting, the art design plays second fiddle in this plot-driven tale. Then again, if James Cameron’s Avatar gets credit for creating an entire alien world after adding a couple of legs to a horse and calling it a plant, I suppose we can forgive a little artistic corner-cutting. Por ejemplo, while at rest the alien antagonists, known as “Mimics,” appear to be large dogs with dreadlocked metal limbs and day-glow ground effects. In motion, the Mimics are blatant recreations of the Squiddies from the Matrix, only this time they formlessly writhe and tumble around like those Wacky Wall Walkers from the early 80s, burrowing through sandy beaches and propelling themselves across water with a disdain for physics that rivals any monster movie (this particular gripe is less about Edge of Tomorrow in particular than it is about the sad state of CGI in modern film as a whole). The term used for the aliens, “mimic,” led me to believe that the form these creatures take is neither original nor permanent. Could their malleable, metallic visage suggest they co-opt the physiology of life-forms from previously conquered worlds? As it turns out, the reason for naming the aliens “Mimics” is never explored. If humanity is so entirely over-matched and the Mimics have the ability to see the future, why then do the blue-tinged aliens (Alphas) ever get close enough to humans to sustain injury, much less to bleed their time-travel inducing bodily fluids on our protagonists? How in the world will our heroes find the centralized-intelligence alien-queen internet-hub-thingy (Omega) and what are the chances it will be located in an easily accessible and largely undefended location? Eventually a Macguffin, I mean “transponder,” conveniently located in the wall-safe of the same sleep-deprived general who sent Cage to his death in the first place, provides the stunningly favorable answers to these questions. A non-fatal injury removes Cage’s invincibility and imbues the final act with a sense of urgency I almost didn’t realize had been missing. Unfortunately, our heroes daisy-chain action-movie tropes toward a Hollywood happy ending that hinges on a perplexing temporal paradox. Unlike previous sequential puzzlers, such as Primer or Inception, I didn’t walk out of Edge of Tomorrow confident that time spent pondering the conclusion would be time well spent. This entry was posted in Science Fiction Film Reviews by SentientByProxy. Bookmark the permalink. I'm an emotionally stable, passably charming science editor who currently works in movie production. Science fiction is hands down my favorite approach to storytelling; who doesn't enjoy taking a hard look at what is, or dreaming about what is to come?